UNESCO deletes connection between Western Wall, Temple Mount and Jews; Yair Lapid: decision extends terror wave. Yesh Atid chairman and former Finance Minister Yair Lapid wrote a scathing letter to UNESCO over the weekend, stating to chairman Irina Bokova that a decision to divorce the Jewish people from the Western Wall and Temple Mount will lead to bloodshed. "This decision is a shameful attempt to rewrite history, rewrite reality as part of the ongoing political campaign against Israel and the Jewish people," Lapid stated in the letter. "Palestinian incitement regarding the Temple Mount - which has been proven time and time again... has already cost the lives of dozens of Israelis." "Your decision only serves to extend this current wave of terror and will only lead to the deaths of more innocent people," he continued. "You cannot evade this responsibility." UNESCO's Executive Board passed a motion Friday referring to the Temple Mount solely as 'Al-Aqsa Mosque' - and the Western Wall as the Al-Buraq Plaza. Despite being the holiest site in Judaism, the Temple Mount remains under Jordanian jurisdiction. 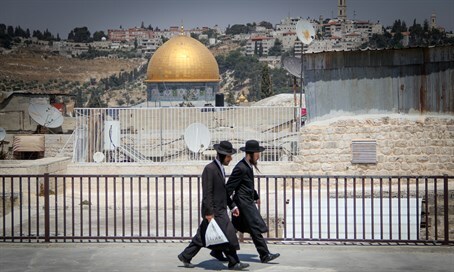 Israeli police, in an attempt to appease the Muslim Waqf which was left in charge of the Temple Mount compound after the 1967 Six Day War, ban Jews from praying or performing any other form of worship.